In this season of giving, sometimes the most enjoyment comes from sharing items you forgot you had instead of those newly received. Three years ago, I celebrated Christmas at the mountain home of my paternal grandparents. At some point, my grandfather mentioned to my father and aunts that he still had a box of their old vinyl records in storage. Naturally, they could not recall what might have been left over from their school days, and my cousins and I were curious about our parents’ musical tastes. We convinced my grandfather to dig out the box. Among the popular albums were a few recordings from bands (like the drum corps) in which my aunts and father participated. 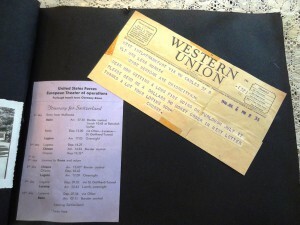 However, by far the most interesting thing in the box was an album of a different kind entirely, a photo album. My grandfather had completely forgotten that he made a scrapbook of his photographs, telegrams, newspaper clippings, and cards from his service in the USFET (United States Forces European Theater) in 1945 and 1946. 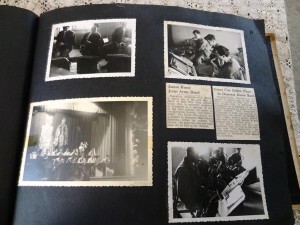 He was a member of “The Statesmen,” a military band, so pages were filled with photographs of parades and concerts. There was even a telegram telling his mother not to send his saxophone just yet. Already crowded around the box, we all leaned closer as my grandfather’s eyes lit up in pleased surprise. He began delicately turning the pages and pointing out certain images to us. 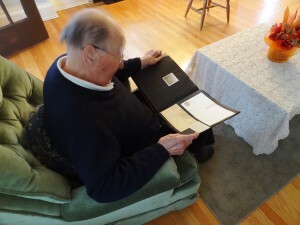 For each item which caught his attention, my grandfather shared stories from his memories. Some were humorous, like when he thought about his old buddies and their antics. Some were poignant, like when he spoke of the German family who helped him and wrote to him after he returned home. Some were even genealogically relevant, like how on my grandfather’s furlough to Switzerland he bought watches still owned and passed down in the family. It was the telegram asking his mother for money to buy the watches which made my cousins and I realize how much we still did not know about our own grandfather. 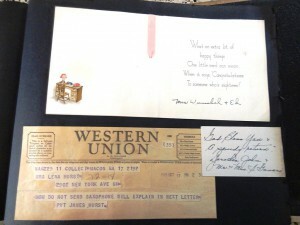 He signed the telegram “Chubby,” a nickname we never knew he had but which was all he was called before he started his own family. That night as we went through the album, we learned about our patriarch’s youth, but more, we all bonded by sharing that moment with him and each other. The gift of that scrapbook has kept on giving. 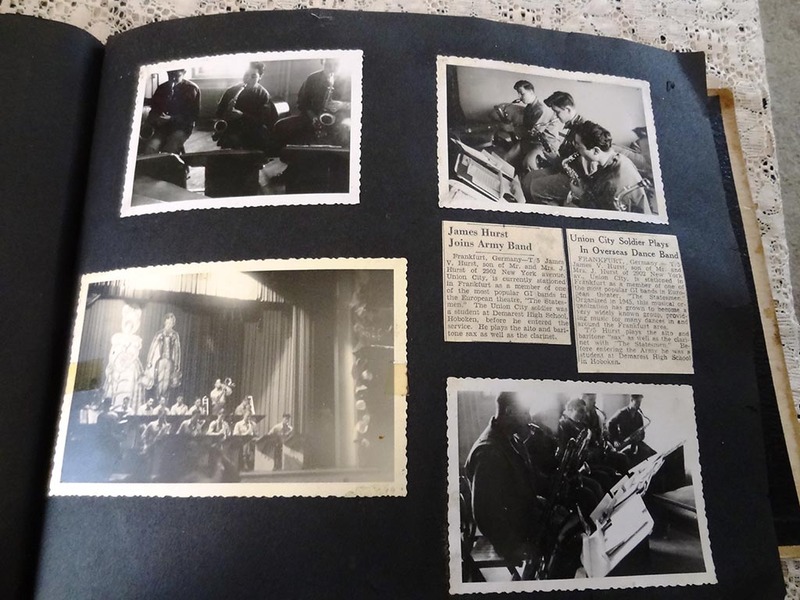 Now one of my cousins is becoming a teacher and has invited my grandfather to talk to her class about his experiences with a slideshow of images from the scrapbook. He never knew his own family would be so interested, much less a group of unrelated youths. Our rapt attention and questions from that December night three years ago has opened up my grandfather to sharing experiences of all kinds with us and future generations. This Christmas, I will again be with my grandparents, and I sure hope there’s another box filled with memories instead of just the festively wrapped ones under the tree. My Christmas box story is the reason I really got hooked on learning my family’s history and my genealogy. I was starting to play with looking up my ancestors but had not found that one thing to really “hook” me. I had promised my grandmother before she died that I would learn the family history and share it with my cousins and my mother. Little did I know what I would find! 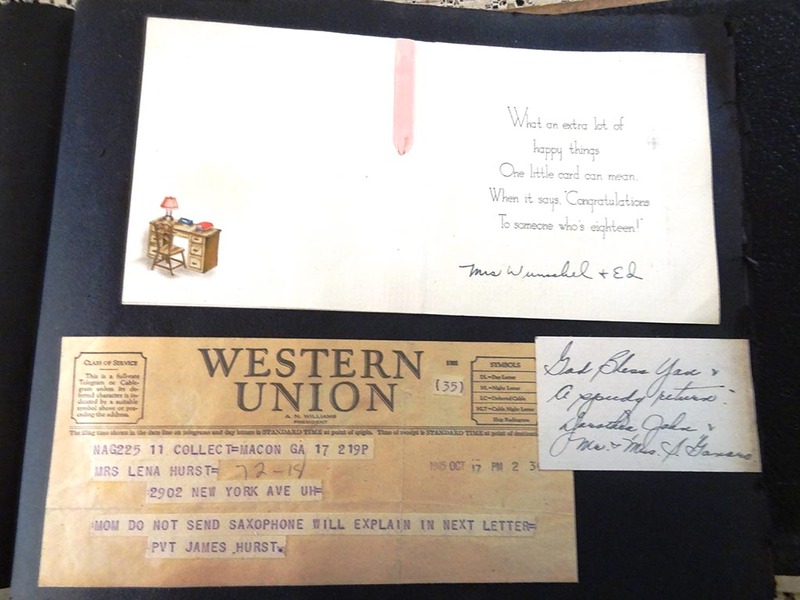 During my annual Christmas trip home I asked my mother if we had any old family papers I could look at because I was not getting anywhere in my research and was about to give it up. She responded with, “Oh, there’s a shoebox of papers up in the attic. Try and find that.” So, I trudged upstairs and eventually found a box of papers. After returning downstairs I settled down to explore the box. The very first paper astounded and confused me. It was a Revolutionary War Pension Paper for a Jedidiah Caswell. Being an American History teacher I immediately freaked out especially when I found several more copies of that and his pension papers. Then two mysteries. First, why were there pension papers for both Massachusetts and Vermont, and more importantly, what was the connection between Jedidiah Caswell and my mother’s family? In other words, I was hooked and have been ever since that Christmas morning.